Advanced Auto Fabrication, LLC officially opened its doors in March 2010. Although it has only been open since 2010, the AAF team has been building and developing high performance street and race cars for many years. Advanced Auto Fabrication, LLC believes that honesty, fair pricing, and keeping up with the latest tools and technology are the keys to success in this business. AAF is all about performance. From putting power to the wheels, to cornering G-force we can get your car set up right. Need more power? AAF has a Dyno in house! We have the ability not only to build custom parts from turbo set ups to custom intake and exhausts, but with an in house dyno we can make sure your car is tuned safe for power and runs perfect for drivability as well. Need better handling? AAF has the newest top end alignment equipment. Not only can we set custom alignment specs for you, but we can corner balance and set weight percentages custom for you as well with our racing specific digital scales. Need abnormal Fab work? AAF has a fully out fitted Fabrication side that can handle any idea that you have. We can do mill work, lathe work, welding, and more. Exotic supercars can be difficult to get serviced in this part of the country. AAF has experience with Lamborghini, Ferrari, Maserati, Alfa Romeo and more. You don’t need to travel to the coast to get yours serviced or repaired. AAF also has experience with custom classic restored American and Import cars. No matter what era your car is from, we understand that your car is priceless. The strange stuff finds a home here. We pride ourselves in working on all the wild ideas that don’t fall into your typical categories. More info. BMW’s are a main stay for our shop. We have built more Spec E46 race cars than anyone in the country. Let us know what your BMW needs and we can help. Parts manufacturing is also a big part of what we do. When we need a performance part that no one builds, we do. When we come across a part that we can build better, we do! Well over sixteen years of professional experience working on all makes and models of automobiles. Focusing on suspension set-up and alignments for the last seven years. Active in auto racing for 16 years winning season championship in 2001 on the circle track. 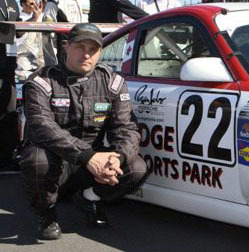 In 2004 he won the autocross championship in FSP. 2008 brought him his first endurance win at the 12 hour ICSCC Race in Portland, OR. Sam has taken on the roll of bookkeeper for the business. She is often on the radio when Hank is racing, and keeps organization at the track.